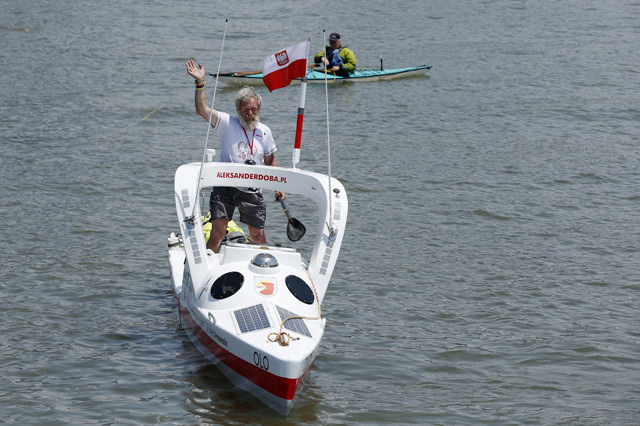 A Polish grandfather left New York Sunday on his third solo trans-Atlantic crossing in a kayak, aiming to arrive in Portugal in time to celebrate his 70th birthday on firm ground in September. Aleksander Doba paddled off from the tip of Manhattan after doing interviews and posing for selfies with a crowd of some 100 onlookers. A star at home, Doba gained global attention when he was named a National Geographic adventurer of the year in 2015. At that point, he already had two solo Atlantic kayak crossings under his belt. The first, between October 2010 and February 2011, took him across one of the narrowest points of the ocean from the Senegalese capital Dakar to the Brazilian city of Acarau. The second saw him set off from Lisbon in October 2013 and arrive in Florida in April the following year, navigating ocean swells and tempestuous weather. On Sunday, he embarked on what he has called his "hardest" journey yet, a 3,700-mile (6,000-kilometer) crossing through storm zones in the frigid waters of the North Atlantic. "I know that this will be the toughest of the three," he said Sunday through a translator. "The water is cold. There are a lot more currents and storms predicted - this will be interesting." But come what may, Doba is determined to make it to the Portuguese capital in time to celebrate his 70th birthday on September 9. "I planned, from the beginning, to make a circle," Doba said. "My dream is to finish this." Doba's kayak, which he calls "Olo," was in large part designed by him. He will be paddling between eight and 12 hours each day. Doba won't let his age get in the way of his dream. "I feel good. I don't want to think about being old," said the grandfather who sports a long white beard. "I feel young and I don't want to pretend that I'm old." Doba was dismissive about risks of the journey. "When people ask me about the dangers of this, I will ask them: Where did you get up from? The bed? Did you know that 95 percent of people will die in bed? So why do you go to bed?"